Green roses may not be abundant in nature but they sure are beautiful. They can often be found around St. Patrick’s Day, Christmas, and Easter. 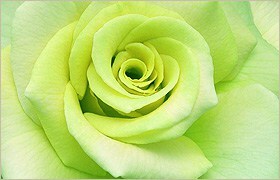 The green rose represents hope and fertility. They can also represent cheerfulness and rejuvenation. The color green is also known for jealousy and greed, but we like to think that the green rose is a symbol of freshness since it is also the color of nature. If you like the color green, but aren’t sure that green roses are perfect for you, check out our article about green flowers for other ideas. You can also find other meanings of rose colors on another post.